The local amateur group appears. To mark the wedding ceremony of the king of Azadpur they are found to be planning to stage Meghnadbadh Kabya. Someone, Prokash has designed and devised a programming machine which is currently affected by virus. He is found struggling to reprogramme it. This is, eventually, the fourth time the king is going to get married with film actress Himani, the princess. Meanwhile a complaint comes. Seth Iswardas accuses some Lalitmohon trying to influence his daughter, despite the fact that Tillaknarayan is most wisely chosen groom for her. The kingdom observes the strictest law of gifting a death sentence to the daughter failing to agree with the choice of her father. Damayanti and Lalitmahon, thus, workout a plan to leave Azadpur the very next morning. Alakananda, however, another young girl is after Tilak. The stage is found making another plot, the ‘Prakash the Ostad’ of the group distributes different roles of ‘Meghnadbod Kabya’ , and each one prepares learning dialogues by heart. The virtual plain starts playing its role. Indra, the god of all gods, is after ‘apsara’ Urvasi, but the latter has lately grown an affinity for Chang, her newly recruited cook, evidently a Chinese. Prokash, as Indra speaks of his divine therapy, prepares the magic-charm which will divert the attention of those to whom others failing in love and hence redirect them to their unchosen ones including Alakananda, who has been lately graced by Indra. The stage is found making further plot at Nandankanan ,the place of escape. The chaos and confusion contunue.The rehearsal goes on. The locale plays powerful. Intertexuality is read. A pluralistic voice is heard. Heavenly elements co-relate with earthly ones. Urvashi falls in love with some Balai, the commonest of the common human folk, mere a donkey. Indra and Prokash are found talking. Indra is heard about the killing of Meghnad. Indian history is reread since the time of Aryan uprising. Prokash is asked to reprogramme his device so that it speaks of no booted language but of its own, a very particular one in which the people’s dream can be analyzed. As the magic-charm,farther, retransforms characters, the magic reality coincides. Indra – Urvasshi, Tilak – Alakananda and Lalit – Damayanti are paired up once more. Meghnadbadh Kabya is almost ready to be performed. The interpretation of dream, as Balai is taught by the ‘ostad’ of the play within the play, is meant to shape up one’s own dream and reality. It opens up with a declaration of a multiple wedding ceremony to be held. King Raghabendra and princess Himani, Tilaknarayan and Aakananda, and, Lalitmohon and Damayanti are to be soon married. Prokash is meant to have repaired and reconstructed his device with the reality of Indian sub-text. King Raghabendra and princess Himani come to view ‘ ‘Meghnadbod Kabya’ being staged. Finally the drama ends up in a comic scroll of laughter. The local amateur group appears. To mark the wedding ceremony of the king of Azadpur they are found to be planning to stage Meghnadbadh Kabya. Someone, Prokash has designed and devised a programming machine which is currently affected by virus. He is found struggling to reprogramme it. This is, eventually, the fourth time the king is going to get married with film actress Himani, the princess. Meanwhile a complaint comes. Seth Iswardas accuses some Lalitmohon trying to influence his daughter, despite the fact that Tillaknarayan is most wisely chosen groom for her. The kingdom observes the strictest law of gifting a death sentence to the daughter failing to agree with the choice of her father. Damayanti and Lalitmahon, thus, workout a plan to leave Azadpur the very next morning. Alakananda, however, another young girl is after Tilak.The stage is found making another plot, the ‘Prakash the Ostad’ of the group distributes different roles of ‘Meghnadbod Kabya’ , and each one prepares learning dialogues by heart. The virtual plain starts playing its role. Indra, the god of all gods, is after ‘apsara’ Urvasi, but the latter has lately grown an affinity for Chang, her newly recruited cook, evidently a Chinese. Prokash, as Indra speaks of his divine therapy, prepares the magic-charm which will divert the attention of those to whom others failing in love and hence redirect them to their unchosen ones including Alakananda, who has been lately graced by Indra. 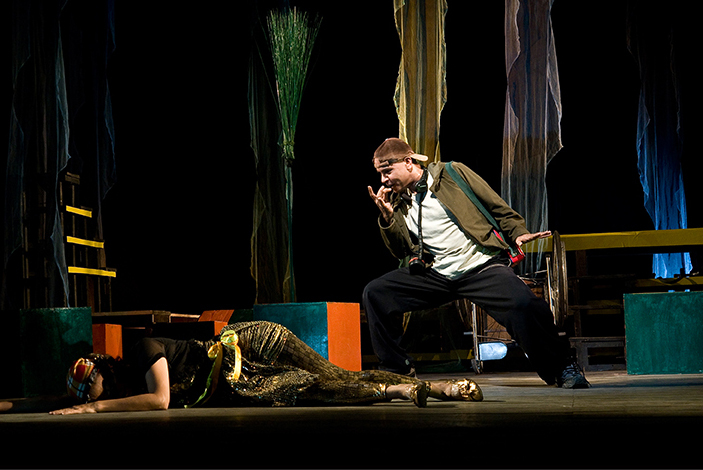 ‘Dream-Dream’ is a Bengalised adaptation of Shakespeare’s ‘ A Midsummer Night’s Dream’. ‘The rites of May’ refers to the celebration of merriment and flirtations. The merry note of festivity of life is, thus, drawn into drama with the resonance of ‘drim-drim’, the very sound word, itself. It plays the basics of music and dance, apart from humor, magic and spectacle. The final element of this play is dream .The cultural hegemony, in this context, is countered and it is hoped that diversity, variation and freedom will seem to exist. By coalescing the real and the virtual, a larger and layered circumstantial entity of human life is plotted. The dream is that of as many as collection of this humanity. And people are allowed to make sense of their own unique dream and achieve a better understanding of them and find the key to unlocking and interpreting to their dream. In this play comes Indian mythology, but, unlike Biblical verses, it hardly speaks of the mysteries of the sole wisdom of the god and godly business. Hindu metaphysics, that says things exist only when they are observed, is farther overwritten as every created dream is connected with people’s own existential reality. In this play comes, too, selected excerpts from the Bengali epic ‘Meghnad Badh Kabya’ and, evidently, purpose the inter-text and the histrionics strike the historicism in reviving, reforming and restoring human memory. Redirecting the linguistics of a unique and unipolar global village, the play lets the technical devices reprogrammed to speak the people’s language as found finally in addressing the audience to say that if they did not enjoy the play, they should imagine that it was all a dream woven at some surface else.